Bundesliga | Hertha Berlin vs. Eintracht Frankfurt: As it happened! Hertha Berlin vs. Eintracht Frankfurt: As it happened! Vedad Ibisevic got into a shooting position after just 50 seconds with the side-netting rippling as Lukas Hradecky's foot diverted his effort. His strike-partner Davie Selke was more accurate after a quarter of an hour to thread his shot through Hradecky's legs and give Hertha a lead which had been in the air. The same could not really have been said of Marius Wolf's equaliser ten minutes later, but he left no room for doubt as he blasted the ball into the roof of the net. The goal knocked the stuffing out of Hertha temporarily and added feathers to the Eagles' wings, which were clipped again by the half-time whistle. As a light snow continued to fall over the German capital, both sides started to get a little hot under the collar with a combative start to the second half. It looked like the game might need something special to resolve it and Kevin-Prince Boateng provided it, curling a pinpoint effort into the top left-hand corner without a moment's hesitation as the ball fell kindly for him just inside the Hertha penalty area. 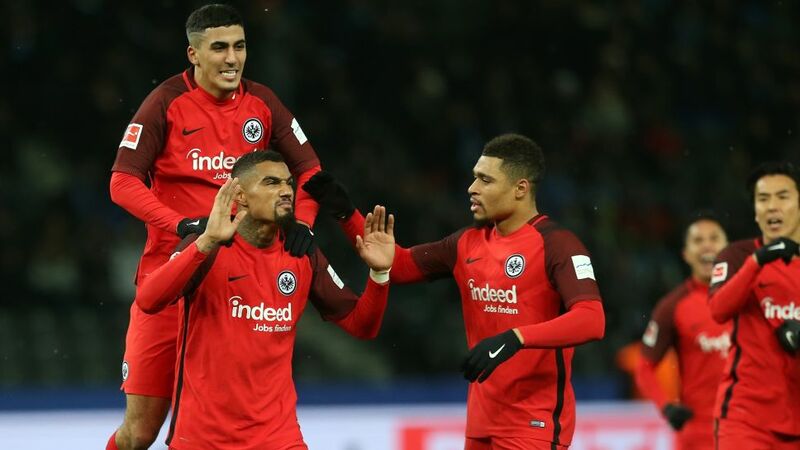 The Berlin-born forward immediately raised his hands by means of apology to the Hertha fans, but he had left them cold with a goal which lifted Frankfurt into a share of sixth. Click right here for the Hertha vs. Frankfurt Match Centre!